Has it really been more than 3 years since LEGOLAND Malaysia opened its doors on 15 September 2012? And can the monkies truly ever get tired of the theme park? Well, apparently not. If your kids love Ninjago and have not been back to the theme park before August 2015, this is the only reason you will ever need to bring them back! Inspired by the hit TV series based on the extremely popular ‘Ninjago – Masters of Spinjitsu’, LEGO ‘Ninjago and The Realm of Shadows’ is a puppet style show brought to life on stage with puppetry, video mapping, illusion, stage effects, and music. The 20 minute show features a total of six puppets and makes use of video mapping and illustrations to bring the set to life, as well as create the effects of the show. And brought to life the show sure did, as the monkies were deeply engrossed in the storyline! No doubt kids will enjoy the show - Ale did too! - and I'm sure parents will too, especially since the show takes place in the fully air-conditioned LEGO City Stage! Coupled with the fact that this is the first time ever in the world that a Ninjago Live Show is introduced to a LEGOLAND park, I think it is a winner. Oh, and remember to stay back after the show for some photo-taking opportunities too! There are 5 shows daily and the timings are correct at the point of writing. A not-that-new attraction that opened in September 2014, the LEGO Star Wars Miniland Display is also a must-go if there are Star Wars fans in the family. Even if you are not, it is well worth a visit as the air-conditioned facility provides a welcome respite from both the sun and rain! The building is divided into eight areas. Six areas house one iconic scene each from the six Star Wars films, while the seventh area features a scene from the animated film Star Wars: The Clone Wars. The eighth area offers a dedicated retail section for LEGO Star Wars products. Read more in detail in my previous review HERE. Located in the top corner of LEGOLAND MINILAND, the miniature Chima world packs in reconstructions of famous landmarks of the land of Chima - including the mystical Mount Cavora and its Chi waterfalls, the majestic Lion City, and the magnificient Lion Temple. Made from more than 241,000 LEGO bricks, it features 7 interactive buttons that you can push to spring it to life. In total 850 minifigures can be found in the scenes and there is even a Chi Orb that changes colour! 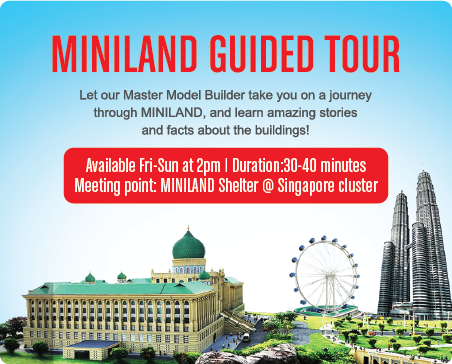 TIP: Go on a guided tour of MINILAND with LEGOLAND Malaysia's Master Model Builder every Friday to Sunday (2pm), and learn the amazing stories and facts about the buildings! Compared to the time when LEGOLAND Malaysia first opened, the park has added a lot more LEGO sculptures which are scattered around the park... which the monkies had great fun using them to ham it up for the camera as you can see. Since we are on the topic of MORE, more shelter and tents have been erected throughout the park. The trees have also since grown bigger but make no mistake, the park can still get really hot on a cloudless day. Luckily, there has been an increase in the number of air-conditioned places within the park to take refuge in. Speaking of refuge, I guess the best form of refuge to seek while at LEGOLAND Malaysia Resort is at LEGOLAND Hotel. Yes, cue wide smiles from the monkies. We first stayed there in December 2013 and if you have not read my 8 reasons why kids will love LEGOLAND Hotel, you should do it HERE. From the themed rooms to the treasure hunt that kids can go on inside the room, everything remains the same - and as FUN for the monkies. During our previous stay, the rooms did not come with any toiletries sets so it was a welcome surprise to see them being included in the rooms this time around. With dental kits catered for kids too! The thing about staying at LEGOLAND Hotel is the lack of activities for kids come night time, since the theme park closes at 6pm. Well, that is a thing of the past as the hotel lobby morphs into a happening place in the evenings! There are dance sessions, special performances, building activity challenges and even baking activities at its BRICKS Family Restaurant to keep all the little ones occupied (and happy). Oh, did I mention Movie Nights and Meet & Greet sessions too? All exclusively for hotel guests! See HERE for the full listing of the month's hotel activities. TIP: Book one night stay (or more) at LEGOLAND Hotel & get 2-day combo tickets for ALL children in the group for FREE! That's free access to both the Theme Park and Water Park for every child in the family. For more details, visit HERE. BUT perhaps, the biggest CHANGE of all from 2012 compared to the present is this. Or her, to be precise. Back in 2012, she was deemed too short for all the rides and could only watch in envy as her 2 brothers ride themselves silly in the theme park. Now, she has shot up quite a fair bit and counts driving the LEGO pedal car at the Junior Driving School as her biggest (and fave) achievement to date. Looks like we will be back sooner rather than later.